King Mohammed VI of Morocco, on Monday, chaired over a working session focused on upgrading and diversifying vocational training, promoting jobs offer and modernizing pedagogical methods, to endow young trainees and graduates with the necessary tools to enter the job market. The King was briefed on the propositions and measures to be taken by the concerned departments to implement the royal instructions meant to restructure thoroughly vocational training, the Royal Office said in a statement. 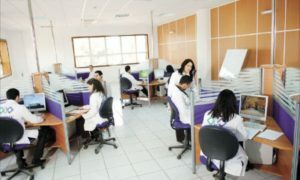 The restructuring includes the creation of a new generation of training centers for young people, the systematization of early counseling to guide the youths to the sectors where they are likely to succeed, the development of work-linked training, the learning of foreign languages, as well as the promotion of youth entrepreneurship in their fields of competence. During the meeting, the Monarch gave his instructions for the development of new trainings in promising sectors and businesses, while upgrading training in the so-called traditional trades, which remain the main providers of jobs for young people such as the sectors of industry, services, construction, agriculture, fisheries, water, energy and handicraft. He insisted on the need to diversify vocational training offer, by adopting new standards of quality, notably in the hotel and tourism sector, which plays a strategic role in Moroccan economy, and in paramedical professions, including the training of technicians in medical equipment maintenance and repair, where employment prospects are promising. The sovereign underlined also the necessity to develop short-term training programs (of about four months), integrate language learning and technical modules for people with experience in the informal sector, with a view to give them the opportunity to access the formal sector and enhance their know-how and abilities. At the end of the meeting, the Monarch ordered the ad-hoc committee, which is chaired by the head of Government, to elaborate and submit, within three weeks, detailed projects and measures that can be applicable immediately. The committee will also present the progress made in preparations for the National Meeting on Employment and Training scheduled to take place before year’s end. The meeting took place after the two latest speeches King Mohammed VI delivered on Throne Day (July 29) and on the Revolution of the King and the People (August 20) in which he outlined a roadmap for upgrading the educational system and vocational training, as strategic leverage for youth employment and professional integration. He had called on the Government to carry out a thorough review of vocational training programs to align them with the needs of businesses and the public sector, and to make sure they are adapted to changes in industry and trades in general, thereby increasing graduates’ chances to access professional life. Written by: Jaber Ali on October 2, 2018. Posted by Jaber Ali on Oct 2 2018. Filed under Headlines, World News. You can follow any responses to this entry through the RSS 2.0. Both comments and pings are currently closed.